Retro Era Italian angel skin coral and 18 karat gold cocktail ring. Elder and Bloom. Although King Edward’s reign spanned the years 1901-1910, when referring to jewellery, the Edwardian Era generally means the years 1901 – 1915. Stylistically, Edwardian era jewellery can also be said to have begun much earlier, during the last years of the Aesthetic Era. The Edwardian era also occurred simultaneously to the French Belle Epoque Era and is also known as The Garland Era due to the prevalence of the iconic garland motif (see under ‘Motifs’ below). 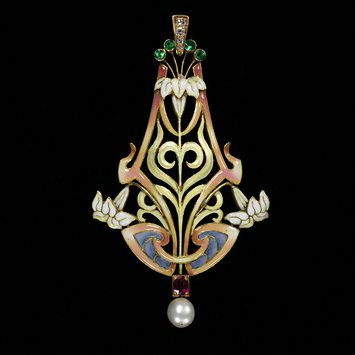 The designs of the Edwardian era jewellery were light and airy, influenced by the fluid lines of Art Nouveau whilst still based on traditional motifs. 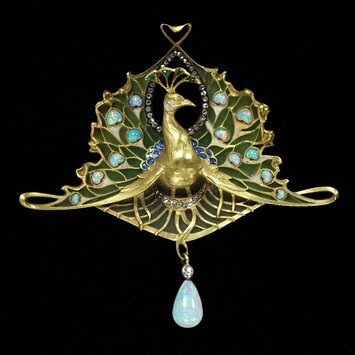 Edwardian era jewellery is perhaps the most ethereal and feminine jewellery of all and can be seen as a rejection of the ostentatious and stuffy designs of the Victorian era. 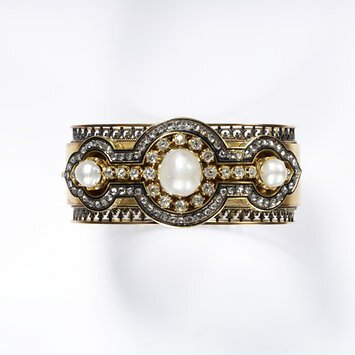 Edwardian jewellery’s emphasis on light coloured materials can also be seen as a reaction to the previous century’s obsession with black mourning jewellery. Although the choker style necklaces, known as ‘dog collars’, were popular in France around 1865, the fashion boomed in England around 1880 when worn by Princess Alexandra. (It is said she was covering up a scar on her neck.) 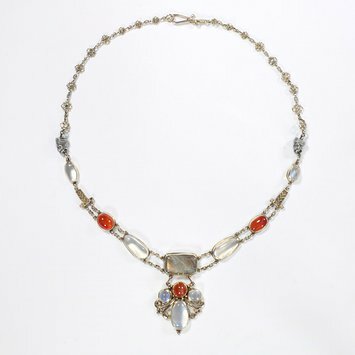 The styles of these tight fitting necklaces ranged from elaborate platinum pieces to wide rows of pearls to black velvet or or moiré, often with a central design in the form of a plaque, a garland, a flower or a buckle. Around 1910, white jewellery began to be mixed with black ribbons, black enamel, jet or onyx. These jewels could be worn whilst still observing mourning etiquette. Edwardian lady. Note the dangling, flowing earrings and the aigrette. She is also wearing a ‘fringe’ necklace, a style popularised by archaeological revival. The fashion for wearing many bracelets at a time fell out of favour. Bracelets were more delicate and refined than ever. Rings were worn stacked, often on nearly every finger. They often had a central stone surrounded by other smaller stones. Parures were no longer in fashion as women wore jewellery of different designs and styles. The lines between what was worn during the day and what was worn during the evening blurred as a more relaxed approach to jewellery emerged. Textile inspired motifs such as garlands and ribbons, bow knots, tassel and fine lace work motifs became extremely prevalent. The garland was such an ubiquitous motif that the Edwardian era is often referred to as ‘The Garland Era’. Inspired by performances such as the Russian Ballet’s Schéhérazade in Paris, tastes turned to all things oriental. Colourful gems, peacock feathers and Indian flavoured designs took centre stage. Although very different in style and materials and manufacuring, The Edwardian aesthetic developed simultaneously to the Art Nouveau and the Arts & Crafts movements, as well as the German Jugendstil movement and other related design movements. They can all be seen as sharing a rejection of the oppressive past and an embracing of freedom and fluidity. This wonderful explosion of elegance, freedom and feminine expresson came to a sudden end with the outbreak of the World War 1, four years after the death of Edward VII. Jewellery manufacturing almost ceased entirely during this period. Precious metals became very hard to come by and platinum, being sought after by the weapons industry, was rarely used until after the war. We have yet to see a return to the exquisite sensibilities of the Edwardian era, although many have continued to wear and revere the styles. It’s vitally important when buying and selling vintage and antique items that the exact eras are understood and accurately described. I know it’s something that I, as a vintage and antique seller, have made mistakes on in the past. I am working all the time on being more precise in my descriptions and understanding. I have written this post as a reference for myself and for other buyers and sellers. For the purposes of this post, I am sticking primarily to Anglo-centric definitions, although it is also useful to have an understanding of German and French definitions of era, for example, if you are buying or selling items from those countries. I will cover terms for those nationalities, as well as for North America specifically, in future posts. It is vitally important to be clear on whether something is actually of the era or just of the style (for example, if something is described as ‘Art Deco’, is the meaning that it was produced between the years of 1920 – 1940 or does it mean simply that it is Art Deco in style? If it is the latter, then it could feasibly have been produced in contemporary times. How often have you seen something described as ‘Victorian’ only to realise the seller meant ‘Victorian in style’ (which, by the way, is not a very accurate term as the Victorians had a vast array of styles). I will write some separate posts in the future about recognizing the difference between the different styles (for example the characteristics of Art Deco style versus Art Nouveau style, but for now this post is concerned with defining eras and terms). This refers to an item which is definitely 100 years old or older. (If in doubt, it is better to stick with the word ‘vintage’). ‘Antique style’ is a meaningless term that is used too often. * POST-1959 is usually defined by decade. Here are some other, less technical terms you will see to describe antiques and vintage eras. I will update these as I think of more (If you can think of any others please let me know 0r if you think I’ve got anything wrong, please tell me). 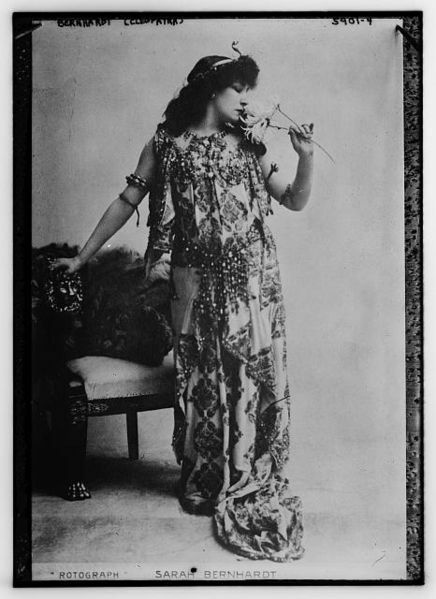 Sarah Bernhardt as Cléopatre. Circa 1899. The Late Victorian era (1885-1901) is also referred to as the ‘Aesthetic Period’. It was an era which was defined by its rejection of conservatism, of tradition and of all things repressive. It was a time of great change in the world of art, fashion and design. William Morris and The Arts and Crafts Movement (1894-1923) became hugely influential and there was a revival of all things Medieval and fairy-tale like. Art Nouveau (1890-1914) began to emerge during this era. Art Nouveau was truly a revolutionary design movement, perhaps the most radically new design movement there has ever been. Japanese design emerged as an extremely strong influence, and there was a new design movement which is referred to as the ‘Aesthetic Movement’ which, in jewelry, is characterized by engraved birds, bamboo and minimal design, usually worked on silver. Overall, there was an explosion of optimism, of creativity and of a new frivolity which, if it had existed previously, had been repressed and under the surface. Decorative hair ornamentation, particularly combs, were the order of the day, as these went with the new uplifted hairdos. Women were now riding bicycles, so purses, glasses and watches were worn on long chains to keep the hands free. Whistle bracelets were also popular for ladies who rose bicycles, so they could summon help from a long distance. In general, the taste in jewelry became much less ostentatious and diamonds and other showy gemstones were considered only appropriate for evening occasions. During the day, women dressed and adorned themselves much more simply, youthfully and altogether with less fuss. Jewelry, when it was worn, became much lighter and smaller. At the same time as this movement towards naturalness, there was a definite swing towards an emphasis of beauty over utilitarianism. Dresses were simpler and made with lighter fabric and would not support heavy jewels. Stick pins, stud earrings and tiny chain purses became fashionable. The taste in colors shifted towards lighter and more pastel tones. Sensuality, femininity and subtlety were the prevalent flavors. Some popular motifs included shamrocks, hearts, stars and knots. Bows were still popular. Novelty motifs were extremely popular, particularly birds and insects. A revival of Ancient Egyptian and traditional Indian jewelry styles also emerged. 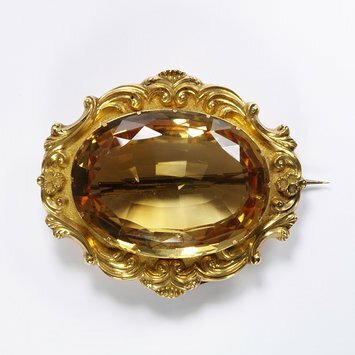 Brooch, gold, enamel, ivory, citrine. 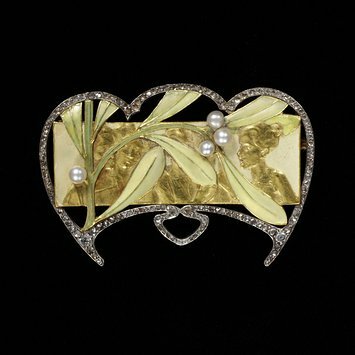 Although Arts and Crafts and Art Nouveau style jewelry were both very popular, there was still a broad taste for more conventional styles. 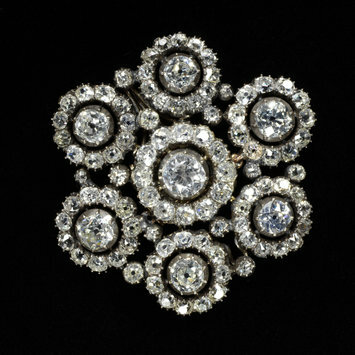 Diamonds, although not considered proper for day time wear, were still preferred for special evening occasions, particularly set in tiaras and rivières. Old mine cuts, cushion cuts and rose cut stones were the most frequently used. Stones were set with less metal and with more emphasis on the gem itself. Platinum began to emerge as a popular metal. Other gems apart from diamonds became more popular during the years of the Boer War (1899-1902). 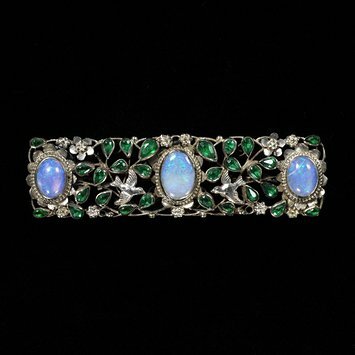 There was an emphasis on cabochon cut gems; opals, amethysts and emeralds were particularly popular. 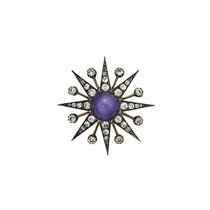 A Star Sapphire and Diamond Brooch, Late Victorian. The Art Nouveau Movement (1890-1910) was a design movement defined by many motifs, but none more so than the Whiplash Motif. The whiplash and curved motifs of Art Nouveau are seen as universally characteristic and are an easy way of recognizing an Art Nouveau piece. 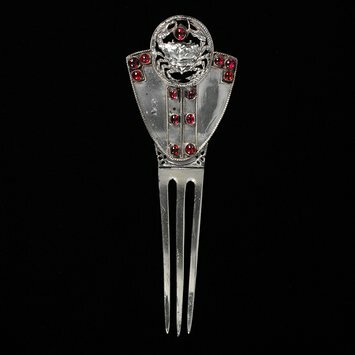 (Arts and Crafts Movement Jewelery, which many would define as a cousin of Art Nouveau, also uses the whiplash motif to a slightly lesser extent. Also it is important to note that there are many other names for Art Nouveau that I will be discussing in future posts). Whilst not all Art Nouveau design pieces contain whiplash or curved motifs, they are generally considered the most commonly found design feature. Some would say Art Nouveau curves have their roots in Rococo Scroll Work, others would say they are inspired by Japanese or Celtic design elements. Whilst all of these are no doubt true, I have always thought of the curves of Art Nouveau design as originating from something deep within us and to be a reflection of our biological nature. Arguably, all design is exactly this, but the curves of Art Nouveau seems to emanate from our deepest levels rather than directly referencing other design movements. These spirals, curves and whiplash-like shapes can be found in both the natural and man-made worlds. France c. 1900, Lucien Gautrait. 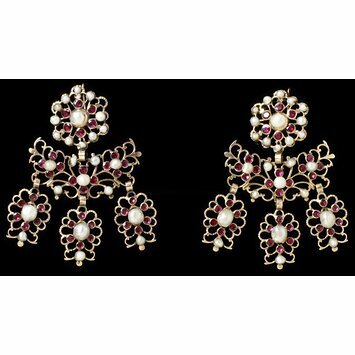 Enamelled gold, set with brilliant-cut diamonds, emeralds,a ruby, hung with a pearl. France, c. 1903. George Fouquet. The mid-Victorian era 1861-1880 is also known as ‘The Grand Era’. The era began in 1861 with the death of Prince Albert, which plunged Queen Victoria into mourning for decades to come. Mourning jewelry became very fashionable and was mandatory in court. Mourning attire became a formalized code and mourning itself became almost like a cult. It seems there was a general obsession with darkness and grief, at least in mainstream Victorian culture. Meanwhile, in the United States, the Civil War had begun, increasing the somber mood internationally. In 1865, the assassination of President Abraham Lincoln truly deepened the world-wide fashion for mourning. After the gaiety and youthful sensibilities of ‘The Romantic Era’, the culture now leaned towards somberness, formality and ostentation. Of course, as always, along side the mainstream, there were other attitudes at play. For every stereo-type we have of the ‘Grand-era’, the opposite was also true. Naturalism, which had become a formal movement in 1850, was still developing and flourishing behind the scenes. The taste for nostalgia and mystery seemed stronger than ever. Whilst prudery and modesty were the order of the day, fashion created what is arguably the most exaggerated female form ever seen in history. With the new jewelry production methods, the taste for novelty could be satisfied with increasingly whimsical and fun motifs. 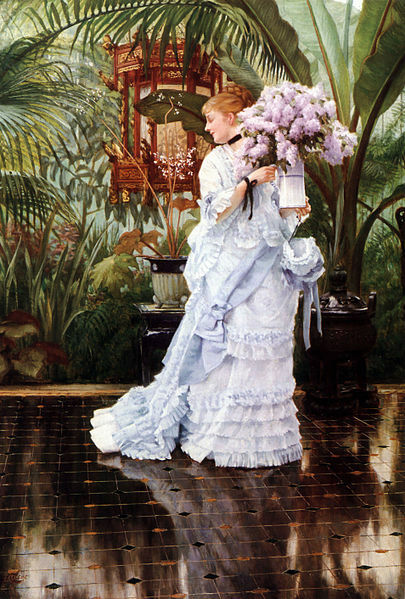 Although the mid-Victorians have a reputation for being repressed and patriarchal, creativity, femininity and sensuality flourished, along side the arts and invention. Notice the simple black ribbons she is wearing at her throat and wrist. Coupled with the colorful dress it is unlikely that this lady is in mourning; rather she is wearing the fashion for black accessories that was popular at that time. Styles were altogether ‘larger’ during the Grand Era and the larger dresses with bustles, hoops and petticoats created a form which called for larger and bolder jewelry pieces. Societal rank, age, occasion and dress determined what jewellery could be worn and when. One manual on etiquette said that pearls, diamonds and emeralds were for full evening wear only. It was also an era of enormous changes on many levels. A revolution in costume jewelry (also known as ‘secondary jewelry’) happened during this period as machines were increasingly being used for jewelry production. The rise of costume jewelry was economically fueled by a new law in England in 1870 that allowed women to keep their own earnings (and therefore spend it on jewelry). The taste for bigger and bolder designs could be satisfied as a result of the new machining methods. As a new middle class emerged, jewelry shifted towards more dispensable and affordable creations. 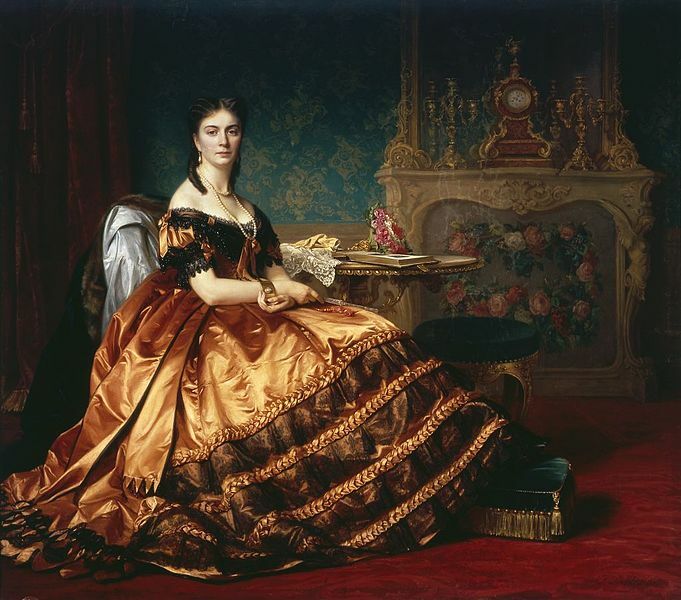 Although Empress Eugenie remained a constant style icon it seems that styles were changing at a much faster pace now, and new designs and reinventions of older designs seemed to emerge with each new season. Gilt metal was replaced by low karat gold and Doublé d’or (also called ‘rolled’ gold or ‘filled’ gold) for costume and lower-priced jewelry. Sheets of brass with a layer of this gold and filled with base metal could be machine stamped (die stamped) into any variety of shapes and sizes. Pinchbeck was replaced by this new process and was no longer used. There was also a series of gold discoveries world-wide which made gold more affordable. These less expensive low karat and rolled gold pieces were rarely marked. Book chain was created with the new stamping machines. The new stamping techniques allowed for the creation of pieces that were referred to as ‘hollow’ work. Hollow work were often engraved and filled with black taille d’épargné enamel (or black-enamel tracery.) Niello, a somewhat similar enamel technique, was also used. 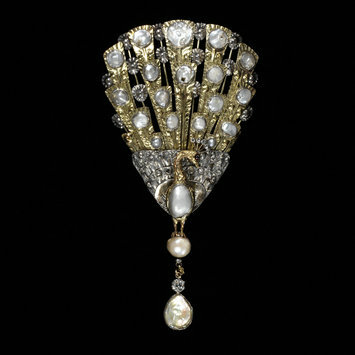 As seems to have been true in almost every era, pearls were highly valued and worn by the upper classes. This lady below appears to be wearing a rope length string of pearls, doubled to create a princess and opera length. Diamonds were more plentiful since they had been discovered in South Africa in 1867 and there was more focus on the gemstone itself with less visible settings. Diamonds were used alone or as a backdrop for colored stones. Tiffany, the largest jeweler in the United States, popularized blue sapphires and tourmalines. A very large deposit of Australian opals was mined in 1871 and the opal at last became popular. 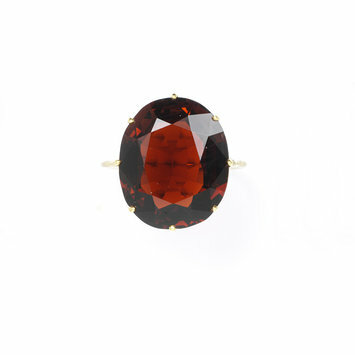 Garnets, sapphires, citrine and topaz were popular stones. Empress Eugenie loved emeralds and they became almost as valued as diamonds. In the 1860s, silver was discovered in Nevada and suddenly pieces which had always been produced in gold were now often made in silver. Once again, the trend towards more affordable jewelry continued. Pique reached a peak in 1860, with machine made pique emerging in 1872. The craze for coral jewelry continued. It was believed to promote health and well being and was still given to children to wear for protection. Hair work jewelry was also extremely popular. There were now rigid dress codes for mourning. Jet was, of course, the most common material used for mourning jewelry; according to many formal mourning attire codes, it was practically mandatory. Less expensive alternatives to jet also flourished; these included black glass called French jet, vulcanite, (a hardened rubber), bog oak, (which although brown was still very dark,) gutta-percha, black onyx and black enamel. Many jewelry pieces from the era had serious and somber designs. Heavy and dark stones such as amethyst and garnet were frequently worn in mourning pieces. Tortoiseshell was also worn. Black accessories were not only worn by those in mourning, but also were worn as fashion statements. The Renaissance and Middle Ages Revival, which had begun in earnest in the 1850s, continued. A key figure of the the Neo-Renaissance style throughout this era was Carlo Giuliano. He embraced the Renaissance aesthetic and adapted its designs to suit the Victorian woman. Enamel work, colorful gemstones, pearls and fleur-de-lis links were common in Renaissance Revival styles. With the trend for the wealthy to take a ‘Grand Tour’ of Italy, ancient and traditional Italian styles and techniques were at the peak of popularity. With all the new archeological discoveries, ancient influences abounded. Cameo experienced a revival. Ancient mosaic techniques were popular. Ancient styles of all kinds, but particularly Etruscan, were very popular. 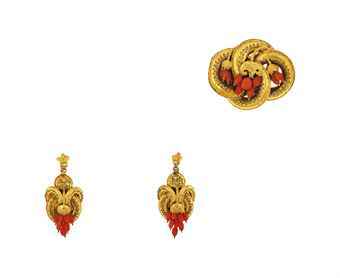 Egyptian motifs for earrings and brooches included lotus blossoms, scarabs, falcons and the heads of Pharaohs. 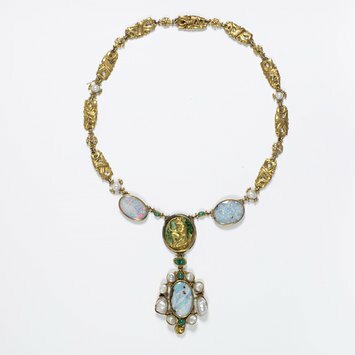 The Italian goldsmith Castellani was the master of Etruscan and Egyptian jewelry. In the 1860s, stars were probably the most popular motif of all. Other naturalistic motifs included flowers, plants and birds. The ‘language of flowers’ continued. The garter motif and the related buckle motif continued. 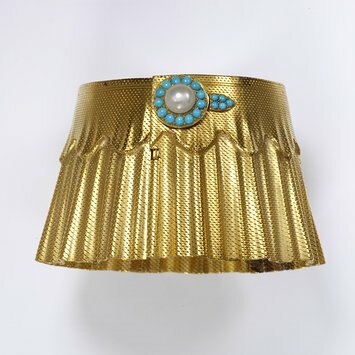 Novel styles became more common during this period, such as this fashionable ‘manchette’ or cuff bracelet below. Fish, lizards, bells, birdcages, household tools such as hammers and other everyday objects were worn, often as dangling earrings. ‘Manchette’ or cuff bracelets became fashionable in France in the 1850s and 60s and then spread to England. 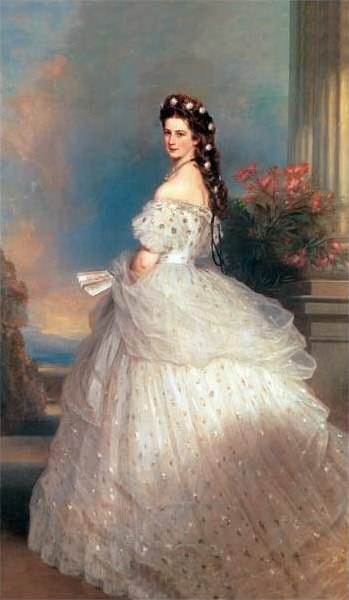 In a letter to her daughter, the Princess Frederick William of Prussia, in 1861 Queen Victoria described a wedding anniversary gift of ‘a beautiful bracelet which he got at Coburg- from Gotha- a large elastic gold bracelet like a cuff – and so pretty’. The gold on this bracelet is textured to look like cloth. 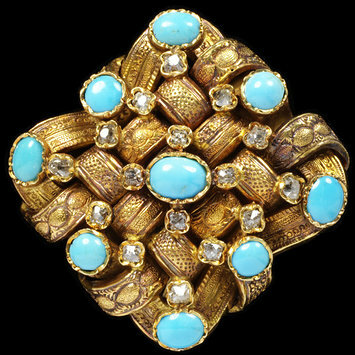 A buttonhole and button are formed of the turquoise and pearl fashionable in the period. Tiaras were revived in the Grand period. In the 1860s, tiaras were designed as wreaths of gold leaves or gabled point with sloping sides. 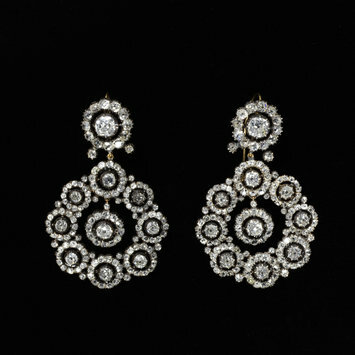 Louis XVI styles with gemstone drops were popular. In the 1870s, the Tiara Russe, a diamond spike motif that later developed into a radiating motif was introduced. Brooches were pinned in the hair. Elaborate combs and bandeau were worn in the hair. Parures (complete jewelry sets) often had Archaeological Revival themes. Gold with enamel, garnets and other small gemstones, carved coral, cameos and tiger claws were popular. Entire sets made with precious stones were rarer. Demi-parures, with an adaptable brooch that could also be worn as a pendant and earrings that could also be worn as a choker were also in style. Shorter necklaces, often with flexible tubular links and with a hanging pendant or trio of pendants were worn. The Léontine chain, (named for the actress) was popular; this was made of woven gold ribbon, with a watch hook on one end and a tassel on the other and was wrapped around the neck with the two ends joined by a slide in front. Wide gold bands were popular, often featuring a central star or claw set gem. The navette-shape (boat-set) with a trio of stones, as well as the cluster and half-hoop rings were popular. Gypsy-set rings, disguising a doublet stone or protecting a very valuable one were created around 1875. Snake rings with gem studded heads were still in fashion. Mourning rings would be lined with hair or black enamel. 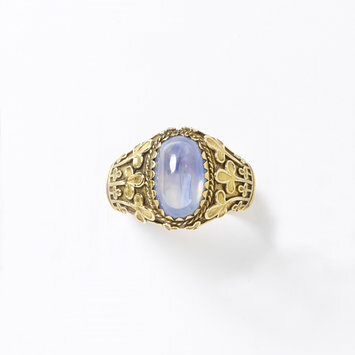 Ring, gold set with a cabochon sapphire in a serrated collet and with applied ornament. By the 1850s, ears had once again began to be shown although revealing the ears wasn’t completely normalized again until the 1860s. Earrings were still only the ‘Shepherd’s Hook’ and the front closure kind. Motifs included archaeological revival with gold amphorae and granulation, twisted wires and rosettes. Hoops, spheres, crosses, flowers, drops, insects, stars and novelty motifs were favored. Pendants were probably the most popular type of necklace in the era. They could be suspended from strings of pearls, from chains or from ribbons. Enameled lozenge-shapes and Renaissance style gem-set cruciforms, often with chains which also had matching enameled plaques. Sentimental lockets containing locks of hair, daguerreotypes and other mementos were universal. Chased silver lockets made their first appearance in the late 1870s. Lockets could also be gem-set or enameled and have monograms, stars, insects, buckles and serpents. In the 1860s, round or oval brooches with a central cabochon or enameled dome in a decorative setting were popular. 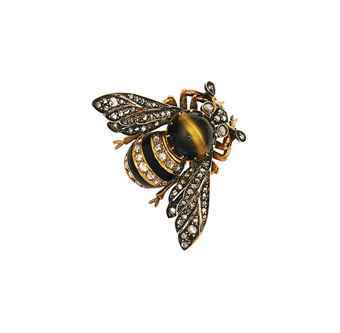 Often, brooches doubled as pendants and therefore brooches began to be orientated vertically instead of horizontally. Roman mosaic, cameos and portrait miniatures were frequently worn in brooches, as well as Celtic and Scottish style brooches. Naturalistic bugs, hummingbirds, feathers and flowers, set en tremblant, were worn as well as stars. Sporting and horse-riding motif brooches with saddles, stirrups, balls, clubs and horseshoes were considered appropriate day-wear jewelry. Bracelets were made of gold curb, ship’s cable or flexible links. They often made a decorative buckle or a central gem-set. It was considered desirable to wear a lot of bracelets together; up to seven or either bracelets or bangles of different designs might be worn on each arm, often over gloves. Bangles were often wide bands with a motif, cameo, intaglio or plaque which could often be detached. Gem pavéd bracelets were considered very desirable. 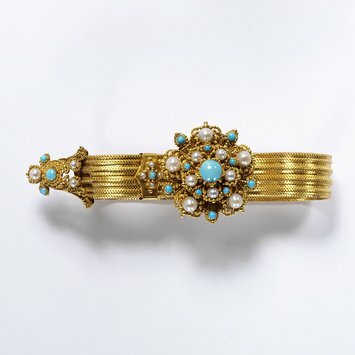 Hinged bangle bracelets were also worn and are probably the item most associated with use of taille d’epergne enamelwork. The Early Victorian period of 1837-1860 is also known as ‘The Romantic Period’. Greatly influenced by the idyllic marriage and courtship of Queen Victoria, the styles of this era reflected this romantic sensibility. As in the Georgian era, sentiment, symbolism and meaning were still vitally important. If the era could be defined in one word, it would be ‘feminine’. Nostalgia for the Middle Ages abounded and Renaissance themes were popular. Women took over men as the primary wearers of jewelry. Gems were now almost always worn opened backed (a jour). Jewelry in the early part of this period was still handmade. However, in 1852 hand operated presses for stamping and cutting settings were developed and jewelry suddenly could be made less expensively. Some of this less expensive jewelry included gilt and glass gems. Pinchbeck was still in use until the 1840s when it was replaced gradually with electroplating. The new use of electroplating, beginning in 1840, caused a new and sudden wave of costume jewelry, making it possible for people of all levels of wealth to wear styles which would have once only been for the upper classes. 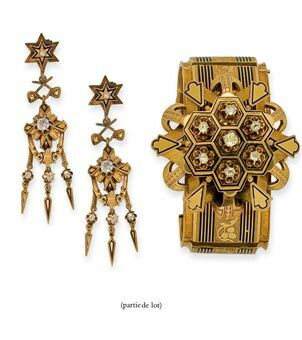 A new middle class was emerging in this era and the jewelry of the day catered to this market; in terms of jewelry it was a very dramatic shift. 1854 marked a big change for gold standards. Prior to 1854, hallmarking was allowed for 22 karat and 18 karat. Tricolor gold and silver were also used. After 1854, 9, 12 and 15 karat gold were legalized, in order to encourage international trade. Suddenly, jewelry could be worn by a shop assistant, a housewife or a Princess; the more rapid fluctuation in fashions reflected this new universality. Generally, it was only considered appropriate for married women of a certain age to wear diamonds and gemstones. 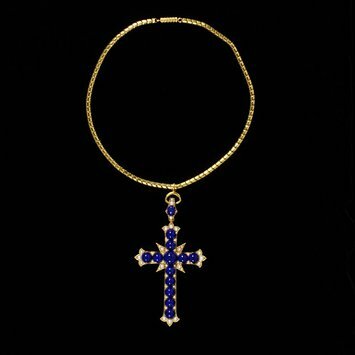 Unmarried women were expected to wear mourning jewelry, chains, crosses and pearls. Victorians on their ‘Grand Tour’ collected micro-mosaics and lava cameos from Italy. Cameos of all kinds were very popular. Swiss enameled plaques also became popular. 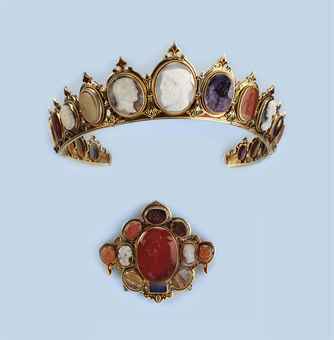 The craze for Scottish Jewelery was also begun by Queen Victoria in this period. Gold etching was popular. Colorful gemstones and diamonds (with rose cut or early brilliant) were loved. Coral was very much in fashion until around 1865. Seed-pearls were extremely popular, particularly with flower motifs, and were often worn as bridal jewelry. Amethyst, topaz, turquoise, chalcedony, garnet and ruby were popular. Agate, onyx, glass, carnelian, emerald, amber, peridot, ruby, sapphire and pearls were loved. Bog oak, cut steel, ivory, tortoiseshell were also used. Elaborate and fantastic pieces were created entirely out of human hair. Jet and French jet (made with glass) were also worn. Serpent jewelry was at its most popular in this era, due to Victoria’s engagement ring having this motif. Snakes meant ‘eternity’. Hearts, anchors and crosses were prevalent. Naturalistic themes were also strongly dominant and many pieces show motifs of flowers, leaves, berries, fruits and berries. The symbolism of flowers was very important to the Victorians and particular flowers motifs would be worn and given because of the meaning behind them. Archeological digs uncovering ancient civilizations inspired a plethora of new ancient-inspired design in jewelry. Sir Austen Henry Laynard published Nineveh and its Remains in 1848. Assyrian styles became popular, including the lotus flower which became a popular Victorian motif for at least the next forty years. When the French conquered Algeria in 1830, Algerian influences began to influence European jewelry; festoons, cords, knots and tassels were common. Acrostic jewelry was also worn. Roses, lilies, chrysanthemums and fuchsias were fashionable flowers. 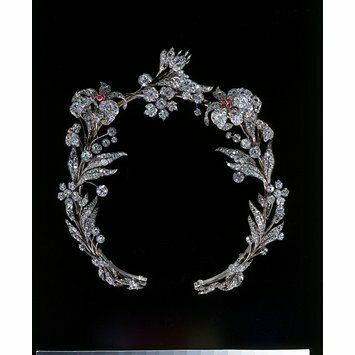 Sentimental and mourning jewelry was worn during this period (although mourning jewelry wasn’t to become a rage until the ‘Grand Era’ 1860 – 1885). Necklaces were usually worn short and close to the neck although long gold chains were also worn. Pave, particularly with snakes and naturalistic motifs, was popular. Pendants and lockets with naturalistic motifs on ribbons or chains, as well as buckle motifs were common. Lockets would usually be worn under clothing, close to the heart. Watches on long chains were worn. 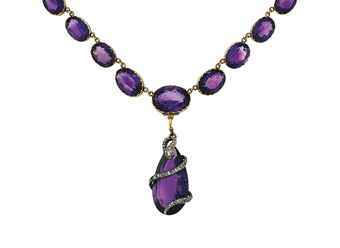 Rivieres, often of amethyst or cameos or seed pearls or coral, were also worn. In keeping with the love of all things Renaissance, Ferronières, were worn by women between the years of 1830 to 1845. These truly charming jewelry items consisted of a chain or cord worn around the center of the forehead with a single dangling gem. Tiaras were also massively popular, with naturalistic motifs dominating until the 1840 when Gothic motifs began to dominate. As 1860 approached, hair ornamention of all manner became more and more popular. 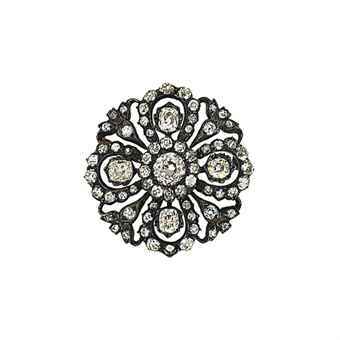 Large brooches were popular. Often, these could double as a pendant and had a loop for a chain. They were worn at the neck during the day and at the décolletage for evening wear. Sometimes, they were worn on the shoulder or in the hair or even on the waist. Sometimes, fresh flowers would be added. Naturalistic themes dominated, particularly flowers, in a corsage motif. Sometimes the leaves were enameled green. 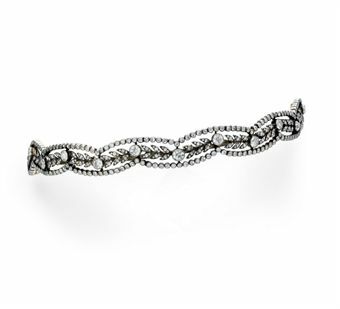 Bracelets were very popular during this era and were probably the most common jewelry item. They were generally very big, at least over an inch wide and were often hinged or with linked lozenges. They were usually worn in matching pairs or in groups. Flexible, stretchy bracelets appeared as these could be worn higher up the arms. 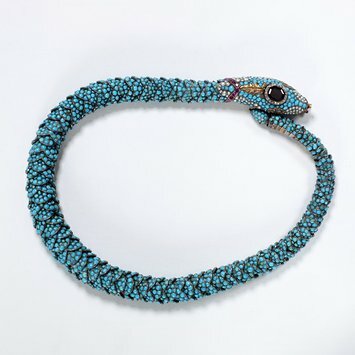 Serpent motifs abounded, often with pave and turquoise and other semi-precious stones. Enamel work, often deep blue, was popular as well as diamonds for the wealthy. Garter (jarretière) motifs were popular. Hair-work and ribbons were common. Mesh bracelets were also popular, often set with cameo or miniatures. Often they would have very ornate clasps. Rings would commonly be figural carved in high relief, snake motifed, gem-set, enameled, buckle or floral motifed. Cluster rings were also worn. Rings would often be worn as love tokens and for mourning (with black enamel). The Arts & Crafts Movement (1860-1910) was a philosophical, political, cultural and design movement that was the human soul’s response to industrialism. It stood for economic and social justice, for a return to simplicity and connection with nature. It was nostalgic for the time of the small-holder, for the freedom of the individual artisan before workmanship became centralized in factories. In a time when everything, including jewelry manufacture, was becoming more and more mechanized and therefore homogenized, The Arts and Crafts Movement looked to traditional craftsmanship and the virtue and beauty of the hand-made. When it came to design, The Arts & Crafts Movement looked to the romance of medieval times, to naturalistic forms and to European folk culture. The movement began in Britain, and was led by the great writer, thinker and artist William Morris (1834-1896). William Morris was the single most influential designer of the nineteenth century. Standing outside the mainstream of Victorian thought and sensibility, William Morris and his followers brought a breath of fresh air, light and youth to the stuffy, grandiose, morbid and dark design sensibility that pervaded that time. It is marvelous to contrast the subtle, sensual, fresh, colorful work of William Morris and his peers with what had come before; his designs must have truly been revolutionary. Indeed, having nothing whatsoever to do with ‘mourning’ and Queen Victoria’s grief that was imposed on her populace or with ostentatious displays of wealth, The Arts & Crafts Movement was, in many senses, anti-establishment. Two other strong influences on the Arts and Crafts Movement were the writers John Ruskin (1819-1900) and Augustus Pugin (1812-1852). The movement, which began as British, soon spread across Europe and to North America. Each country had their own specific interpretation of Arts & Crafts with their own influential designers and writers. It would be lovely to delve into the details of each and discuss each individual country’s interpretation of Arts & Crafts, but I will leave that for the future. Of course, The Arts & Crafts Movement and The Art Nouveau Movement have a great deal in common and some might well argue that The Arts & Crafts Movement was just part of The Art Nouveau Movement. However, if you examine the jewelry of each movement, you will find that, although related, they do have strong stylistic distinctions. 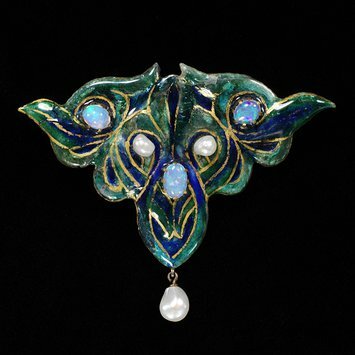 But it has to be said, rather than being necessarily always distinctive in style, Arts & Crafts movement jewelry is always distinctive in being part of a unique philosophy. Arts and Crafts jewelery designers were often painters or architects who then later turned to jewelry design and were often self-taught. Some Arts and Crafts Movement designers (to name but a few) were: Arthur and Georgie Gaskin, Nelson and Edith Dawson, Andrew Fisher, Henry Wilson and C.R. Ashbee. No man is good enough to be another’s master. Arts and Crafts designers believed in simplicity and allowed the method of construction to be seen in the object. They believed that the ideal was for one individual artisan to finish one piece from start to finish. They believed in ‘truth to material’ meaning the quality of the material was entirely important and leaving the material in as close to natural state as possible was vital. But that did not mean they used expensive materials, Arts and Crafts designers gravitated towards less precious metals like brass, copper, silver and aluminum. They loved leaving the hammer marks and demonstrating the hand-made process. Gemstones were understated and chosen for their beauty, rather than as a display of wealth. Cabochon cuts were more common than faceted stones and were often bezel set. Pearls were loved by Arts & Crafts jewelers, with an emphasis on less perfectly rounded specimens. Lapis, turquoise, carnelian, ivory, tourmaline, opal, peridot, moonstone and malachite were some of the other materials that were loved. Craftsmanship and artistry was considered more important than value of the materials. 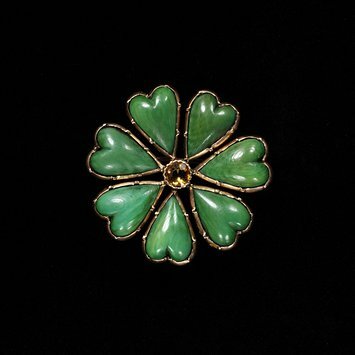 Enameling was of course hugely popular with Arts & Crafts movement jewelers, and many pieces displayed marvelous, sumptuous colors that are clearly reminiscent of Renaissance enamel work. Arts & Crafts enamel work was simpler, using Limoges enamel techniques (where enamel is painted across the whole metal like painting a picture), than Art Nouveau, which favored the more sophisticated plique-a-jour. The Arts & Crafts movement looked to nature, to tradition, to flora and fauna. Several Arts & Crafts Movement workshops and guilds were set up in the countryside of Britain and elsewhere and explored old techniques and methodologies. The Gothic Revival (1830–1880) was greatly influential to Arts & Crafts design, and the romance and naturalism of the medieval past was dear to the heart of the designers. Motifs included winged scarabs, flowers, birds, leaves, peacocks and ivy. Celtic and Etruscan design was strongly influential. The sailing ship was also a recurrent and distinctly Arts & Crafts motif. Cloak clasps, brooches, hair ornaments, rings and pendants, bracelets and cufflinks were more common. Earrings were rarer. Arts & Crafts designers had much in common with the ‘Pre-Raphaelites’ who also rejected mainstream Victorian sensibilities and looked to the past for inspiration. Rosetti and Mallais were two Pre-Raphaelite painters who liked to feature Arts & Crafts jewelry pieces in their works. 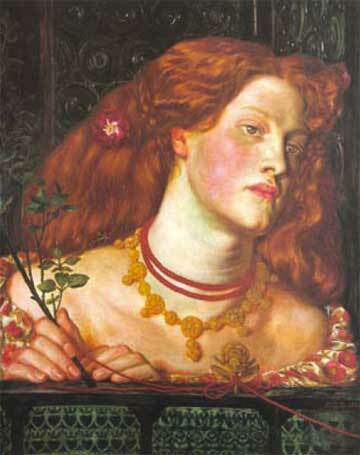 Dante Gabriel Rosetti, Fair Rosamund (1861).© National Museum of Wales. It is perhaps ironic and a little sad that although the stated intent of the Arts and Crafts Movement was to bring the common man beautiful hand-made design, the cost of labor meant most Arts & Crafts Movement items were out of reach for all but the wealthy. Some would argue that The Arts & Crafts Movement was intrinsically an elitist philosophy although it aspired to be the opposite. The Arts & Crafts Movement designers and artisans said that they believed in ‘the moral purpose of art’. Truly, when you look at the amazing work they created and your heart and soul just lift and then you compare that to the machine made, poor quality, mass produced jewelry that is so prevalent today, I really believe they were right. There is a moral purpose to art and Arts and Crafts Movement jewelry fulfills that purpose. 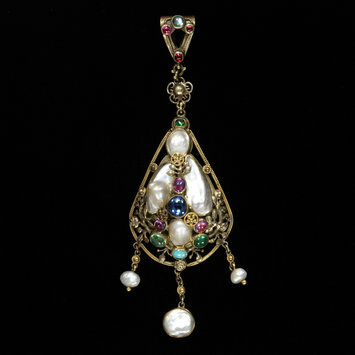 Pendant gold openwork, gold openwork, pearls, blister pearls sapphires, emeralds, rubies, moonstone, turquoise.